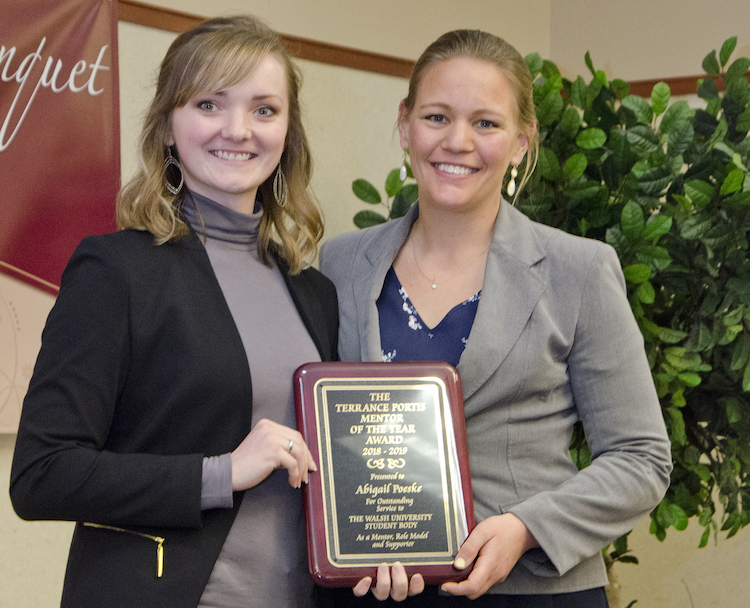 The Walsh senior class has named Director of Career and Experiential Education Abigail Poeske as the 2019 Terrance Portis Mentor of the Year, during the University's Servant Leadership Banquet on Sunday, April 7. As a member of the Experiential Learning Team, Poeske fosters student career readiness and development, and provides hands-on experiences and connections to the community in ways that contribute to students' lifelong career success. In her current role, Poeske engages students in curricular and co-curricular experiences that lead to career competencies while preparing Walsh graduates for the workforce. Poeske brings to this position more than five years of experience nationally and internationally in community outreach, student development and experiential learning-based program coordination. Abby joined Walsh in 2016 as Director of Student Life at the University’s campus in Castel Gandolfo, Italy, and, in 2017, she was named Director of Service Learning. She earned her Master of Business Administration from Walsh University and her Bachelor of Arts in Education from The University of North Carolina-Chapel Hill, where she was awarded the Buckley Public Service Scholar Award for Community Service and Academic Honors. In 2012, Walsh University dedicated the Mentor of the Year Award in memory of past recipient Terrance Portis '08, who passed away on January 25, 2012, at the age of 27. Known for his outreach to all students, Terrance was nominated as the 2011 Mentor of the Year. The recipient of the Mentor of the Year award is nominated by the Walsh senior class for their outstanding guidance, education outside the classroom and significant contributions to their college experience.